There’s a meme going around in conservative social media circles showing Margaret Sanger speaking at a KKK rally. The photo is fake. But... the reproductive rights activist really did address a meeting of KKK members in 1926. The photoshopped image was created in 2006 as part of a contest from an anti-Sanger blog. Sanger was an early and vocal advocate of birth control, and her legacy is fiercely debated regarding her promotion of eugenics and white supremacy. The blog contest, unsurprisingly, was pretty specific: Since there are no photos of Sanger addressing the KKK, people were supposed to create art commemorating the event. Participants in this year’s contest are encouraged to commemorate Sanger at the Klan rally in unique artistic ways. Drawings, cartoons, historical novels, haiku, dance, plays, videos, paintings, quilts, rap, actual photos of Silver Lake, modern interpretations of Sanger speaking to the Klan, reenactments of the actual speech on YouTube, audio recordings of actual Sanger quotes she may have reused when speaking to the Klan - - there is no limit to the artistic ways this historic event can be commemorated. 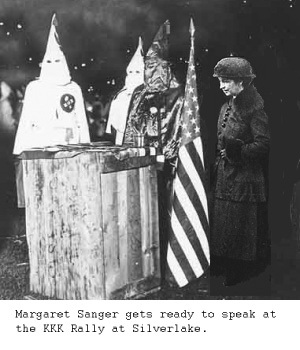 The actual photo of Sanger was taken in February of 1931, just before a speech she was going to give in front of the a US Senate committee. The real KKK image on the other hand, shows Klan members saluting a cross. But this one didn’t go viral, unlike the other one–which has had a decade-long life floating around the internet. 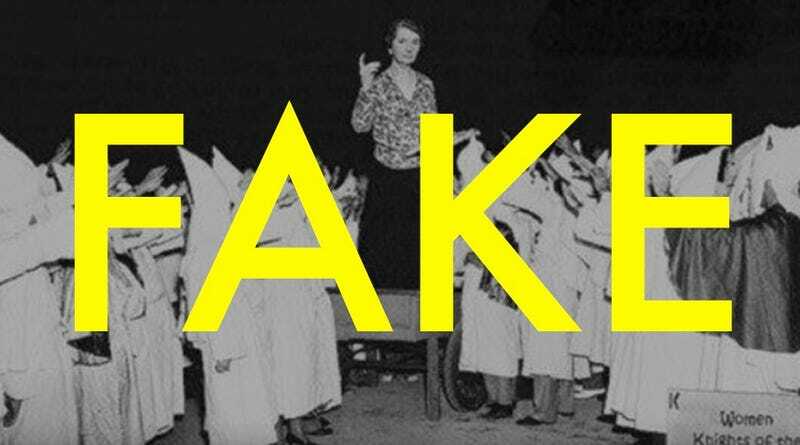 Whatever you think of Sanger’s legacy, photos of her at a Klan rally are fake.